After wrapping up its regular season last week, the men’s soccer team then played in the NESCAC quarterfinal on Saturday, where it lost to Bowdoin. The Jumbos had emerged as the No. 3 seed in the postseason conference tournament after tying the Polar Bears in a scoreless match on Wednesday. The draw resulted in Bodwoin taking the sixth seed in the eight-team tournament, meaning that the teams were set to play three days later on the same field. Although neither side was able to break through on Wednesday, Bowdoin emerged with a 1-0 win on Saturday to advance to the NESCAC semifinals. The NESCAC quarterfinal matchup was physical and intense, with each team committing six fouls. There were two yellow cards awarded in the first half, one to Tufts’ leading scorer, junior forward Nathan Majumder, and another to Bowdoin first-year forward Levi Morant. These bookings had consquences later in the match: Majumder picked up his second yellow card in the 50th minute, thus receiving a red card. He was ejected from the game. 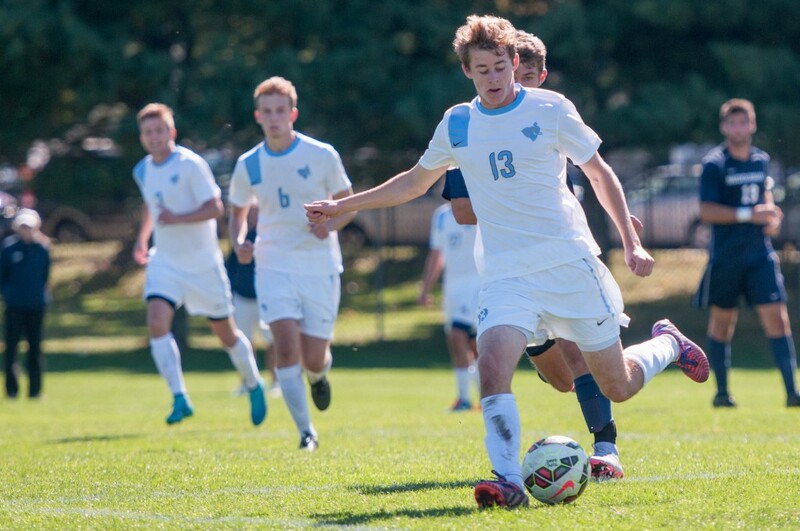 This left Tufts with 10 men on the field for the remaining 40 minutes to try to dig out of a one-goal hole. Bowdoin’s lone goal of the game had come in the 25th minute when senior tri-captain Nabil Odulate converted a short chance past junior goalkeeper Scott Greenwood. The opportunity came off a corner kick that Bowdoin played into the box after its free kick attempt was knocked out of bounds by Tufts, and the assist on the goal was credited to junior Patrick Kearon. It was the first goal that the Jumbos had allowed since Oct. 4 against the Hamilton Continentals. Entering halftime, Tufts could point to its 7-1 shot advantage to instill confidence that it could score against Bowdoin in the second half. Despite Majumder’s red card, the Jumbos still outshot the Polar Bears 6-1 in the second half and had many quality chances to equalize. Sophomore goalie Stevie Van Siclen stood on his head and made seven saves despite being barraged with shots throughout the afternoon. Kayne and junior Kevin Lawson each had two shots on goal, but neither could convert them into goals. Sophomore Kevin Halliday and Majumder also got shots off on Van Siclen but experienced the same fate as their teammates. The loss knocks Tufts out of the NESCAC tournament and leaves the team waiting until Nov. 9 to hear if it will be selected for an at-large bid into the Div. III national tournament. The goal-less effort on Saturday followed a scoreless draw on Wednesday. The two teams played 110 minutes on a rainy afternoon on Kraft Field with neither able to hit the back of the net. Once again, the hosts held the advantage in shots by a tally of 17 to 9, but Bowdoin shot six times on goal to Tufts’ five. The best chances for each team came in the overtime periods. Tufts had four corner kicks in the first overtime, a set piece on which the team has been dangerous all year but could not convert. In the second overtime, Kayne ripped a shot that required a dive by Van Siclen to tap the ball over the crossbar. The Polar Bears’ best chance came in the second overtime, when senior tri-captain Andrew Jones sent a ball into the box where Morant headed it toward the goal. Greenwood was there for the stop, and this game marked the sixth consecutive shutout for the Jumbos. The draw also extended Bowdoin’s unbeaten streak to five games (the team had gone 3-0-2). That streak was extended to six games on Saturday. The upset against Tufts came on a day when the top seeds in the conference had similar trouble. Top seed and undefeated Amherst, which is ranked No. 1 overall in the country, fell to eighth-seeded Wesleyan, 1-0. No. 4 seed Conn. College was pushed to penalty kicks by fifth-seeded Williams before the Camels pulled out the victory. The only top seed that had an easier time in the quarterfinal was No. 2 Middlebury, who defeated seventh-seeded Trinity by a score of 5-0. The Jumbos’ loss potentially ends a season where aspirations were to repeat what the team did last year and defend their national championship title. The team will wait and see whether its goal of winning the ultimate prize can still be accomplished.